With the recent increase in traffic to the blog, I thought you might want to know where you are all coming from. The image above is a part of a screen shot from sitemeter.com, and shows the last visitor (red dot), last ten visitors (green dots) and the last 10+ visitors (white dots) to the blog. 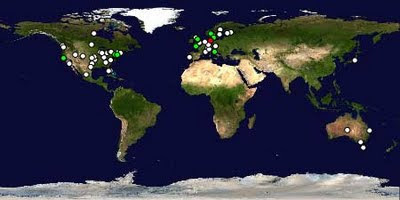 As you can see from the image, recent visitors have come from a number of countries including Canada, United States, France, Portugal, Sweden, Austria, United Kingdom, Italy, Germany, Finland, Switzerland, and more! Japan and Australia are also reprezentin'. Good blog, boy, did those synth ads made me dream too when I was a teen!